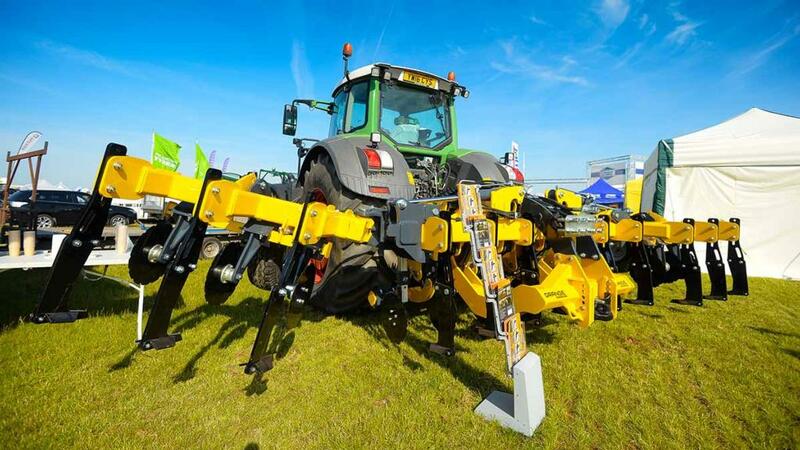 Crowds gathered at the recent Cereals event to see the latest developments in arable machinery and technology. Jane Carley, Geoff Ashcroft and Richard Bradley bring you the highlights from the event. Pictures by Marcello Garbagnoli and John Eveson. 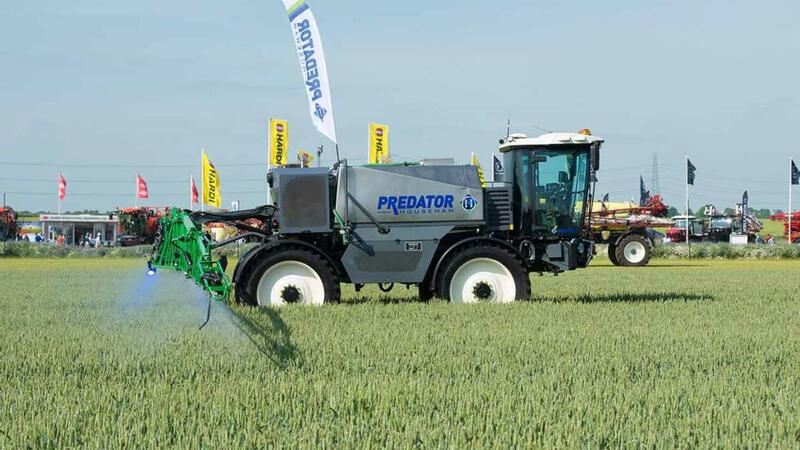 Househam showed its latest Predator self-propelled sprayer which the firm says features a high spec as standard. This includes individual nozzle control with a quad body and automatic nozzle selection to suit pressure/speed. Featuring Househam’s own Excalibur Cat 4 cab with ROPS, the Predator is powered by an MTU 230hp engine, with a hydrostatic transmission providing 50kph top speed. Track width can be manually adjusted from 72-84cm and ground clearance is about 1m. Hydraulic suspension using accumulators at all four corners is also featured. The spraypack uses a 650 litre/min centrifugal pump, and boom widths are from 24-36m. Househam says the 5,000 litre version shown will be joined by a 4,000 litre model and ultimately higher capacity models. 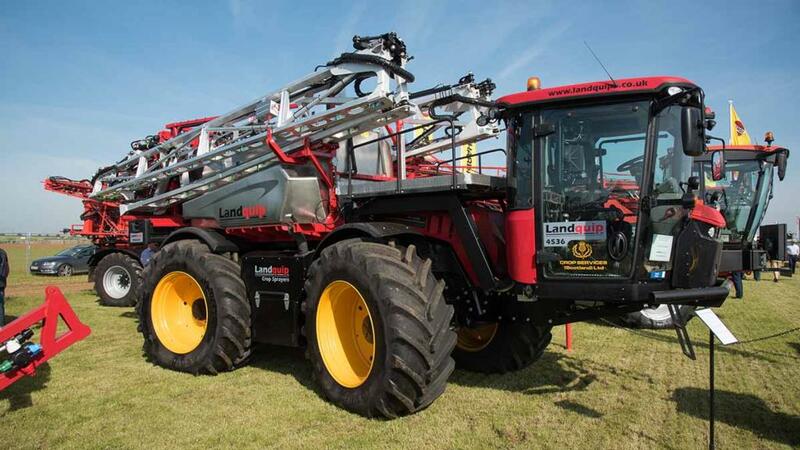 A three-year service and maintenance package is being offered with this sprayer which is expected to cost £212,000. 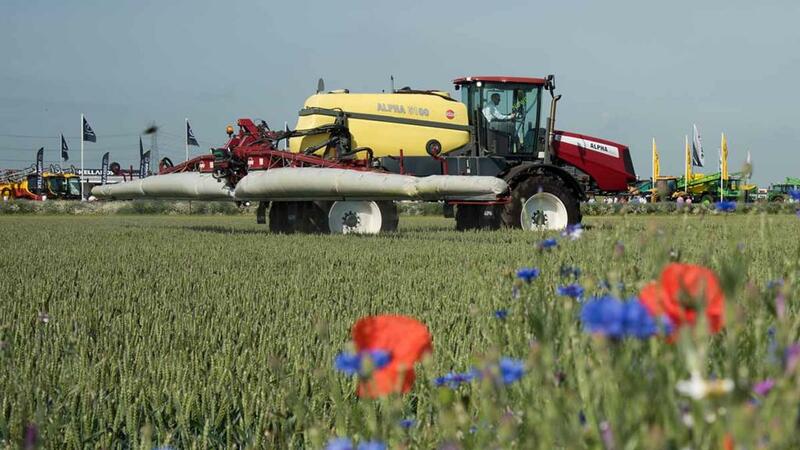 Agrifac introduced the Milan trailed sprayer which uses much of the technology featured on the company’s Condor self-propelled machines, such as its Greenflow Plus liquid control system and Ecotronic Plus control terminal. Boom widths are up to 45m and four tank options are available from 3,500 to 6,800 litres. 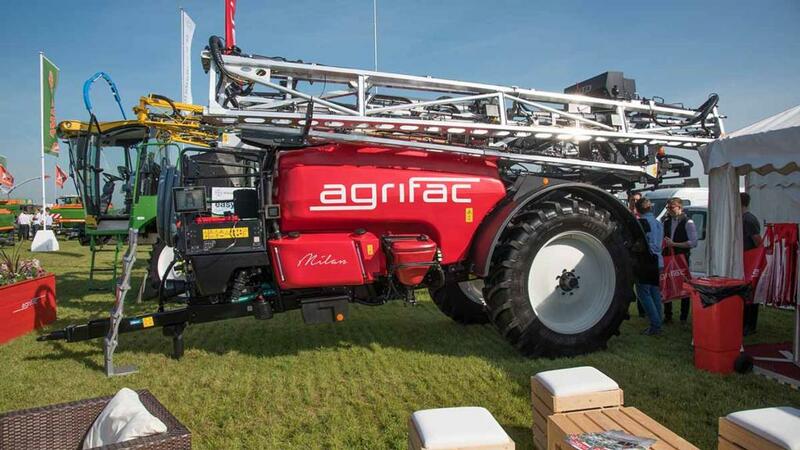 Specification includes Agrifac’s High Air Tech Plus nozzle control, air shut off, auto fill and boom levelling. Steering axles and spring suspension boost stability, and maximum travel speed is 50kph. 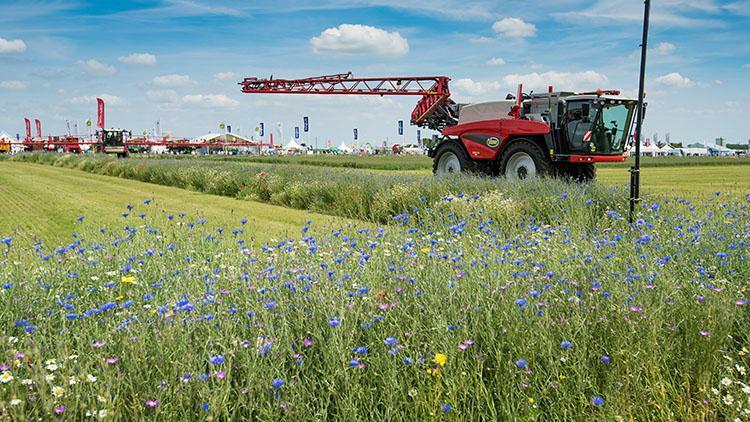 Agrifac’s Chris Potter suggests the Milan is most likely to appeal to existing customers wishing to replace their second self-propelled sprayer with a large capacity trailed machine and make use of tractor power on the farm – prices are from £60,000. Teejet’s Dynajet Flex 7140 is a pulse width modulation (PWM) nozzle control system with 20hz solenoid operation said to give faster duty cycles. PWM allows application rates to be maintained at a range of forward speeds without changing droplet size. Operators can also control droplet size without swapping nozzles, allowing a coarse spray quality to be selected alongside watercourses and then switched to a finer spray for the rest of the field. 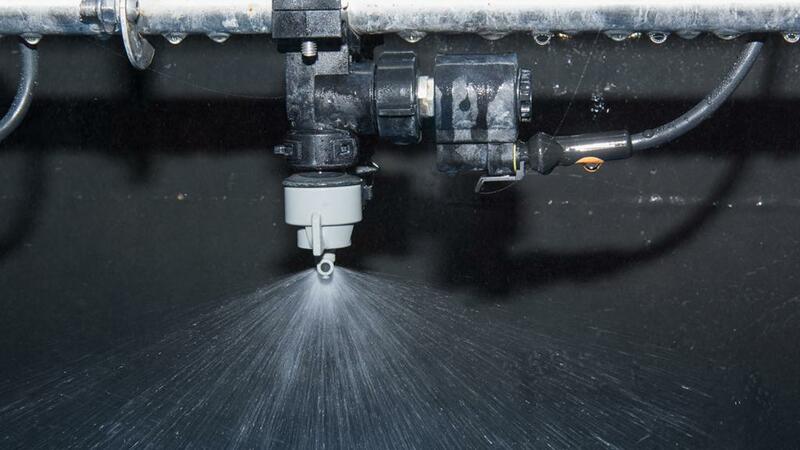 For variable rate spraying it also allows a wide range of application rates from one nozzle. 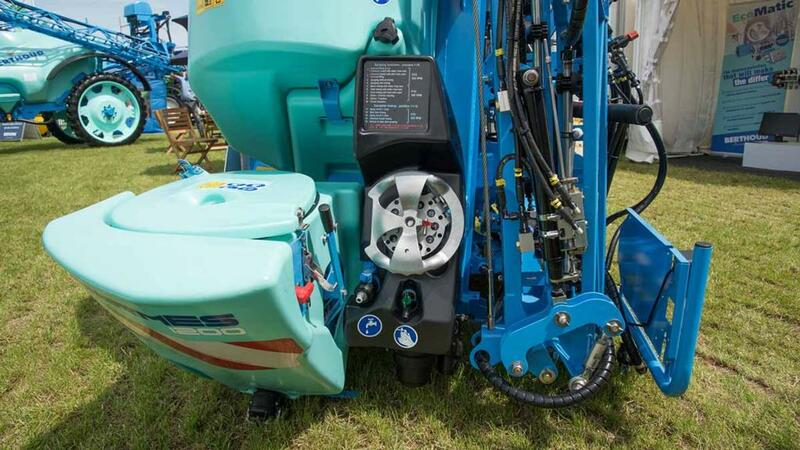 Future developments include ISOBUS control to fit the system to any sprayer and turn compensation. The cost to fit Dynajet Flex 7140 to a 36m boom is £18,000. Landquip’s JCB Fastrac forward control chassis first seen at LAMMA has now been fitted with a spray pack. The Landquip 4536 has a 4,500 litre steel tank and 32m Aluminium boom which can spray at 24,28 and 30m. Control is fully ISOBUS via the Trimble screen in the Fastrac cab at the front, giving GPS section control and autosteer. Using a 450 litres/min piston diaphragm pump to give high outputs for liquid fertiliser application, the sprayer has auto fill with programmable cut out and Pozi Flow recirculation. Maschio Gaspardo showed an extended range of sprayers with trailed models up to 6,500 litres capacity and aluminium booms up to 36m. The top of the range Camp 65 features an adjustable track width from 1.65-2.25m and specification includes steering axles with hydraulic suspension. Booms are suspended via a parallelogram, with hydropneumatic suspension and hydraulic self-levelling. A rapid fill kit uses the 1,000 litres/min centrifugal pump and large diameter pipework to cut filling time, and there’s a choice of Arag controls or a Muller IsoBus terminal. Tecnoma now offers the Pentix SP five nozzle holder for its sprayer range, offering pneumatic nozzle selection via a remote switch. Rotation of the nozzle holder uses a dedicated control box. Available with a standard diaphragm check valve or pneumatic twin diaphragms for boom circulation, the Pentix SPis designed to speed nozzle selection and increase safety as the operator does not have to come in contact with a contaminated boom. 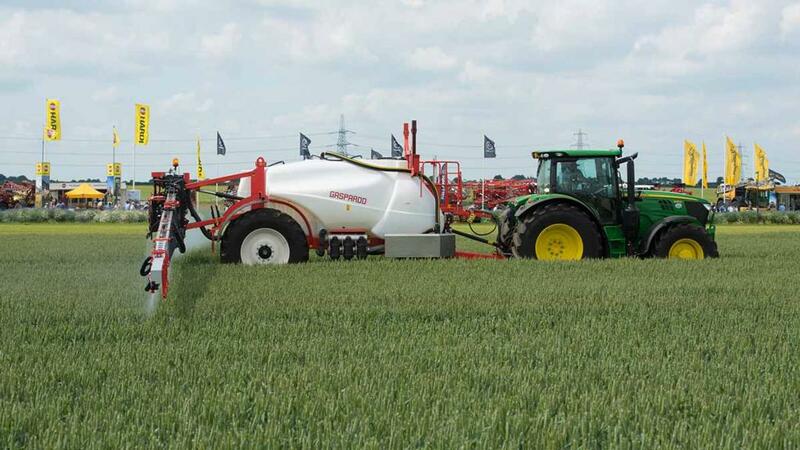 Berthoud says its latest Hermes mounted sprayer range offers simplicity of operation via the Ecomatic valve assembly, which features 15 filling, mixing and spraying functions controlled via single rotary control. When the appropriate position is selected on the control wheel, the relevant valve is activated, and a numerical guide shown alongside is said to minimise mistakes. Currently available in 800-1,200 litre tank capacities with booms from 15-18m, the Hermes also features a redesigned tank with diamond shaped sump for easier emptying. Replacing the Mac and Force models, prices are from £16,875. 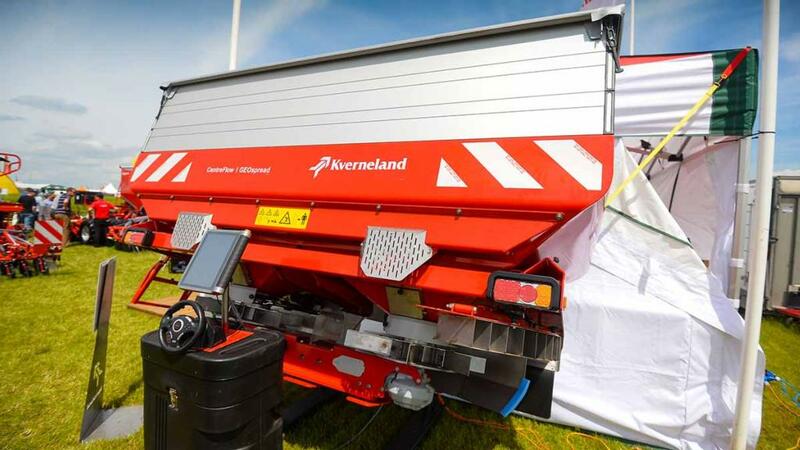 Aimed at users requiring high fertiliser application rates, Kverneland has increased the spreading capacity with its TLX GeoSpread. Offering 40% increased flow rate, the updated model is capable of dropping 540kg of fertiliser onto each disc per minute. In simpler terms, when spreading at 24m width, and an application rate of 1,000kg per hectare, forward speeds of 13.5kph are possible. To allow the greater flow, larger and wider opening shutters are featured, with heavier duty discs and vanes to cope with the extra volume dropped onto them. In a similar light, border spreading vane also has been beefed up. The firm says maximum spreading width remains at 40m, with hopper capacity topping out at 3,900 litres. GeoSpread models are also IsoBus compatible, with weigh cells and automatic section control. 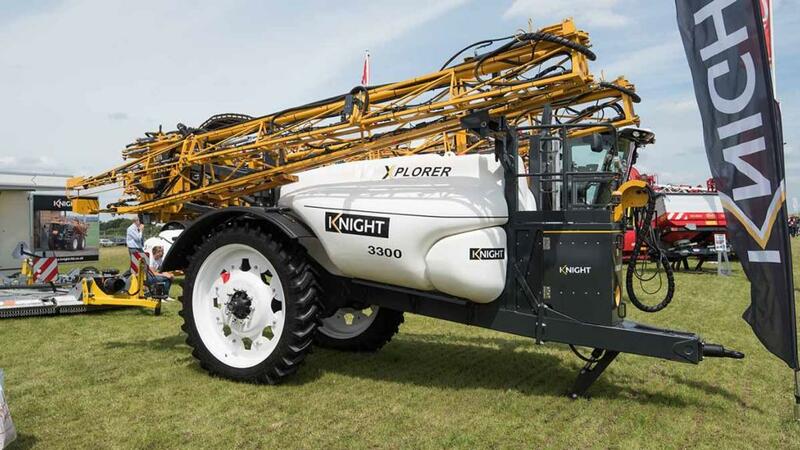 Knight Farm Machinery showed the Xplorer trailed sprayer available in basic and more sophisticated versions. Both spec levels come with Knight’s 3-series boom up to 28m, 3,300 and 4,400 litre tanks and a steering axle, rather than the traking drawbar of its ESEU predecessor. Built by sister company Farmgem, the higher spec Xplorer i features ARAG individual nozzle switching giving GPS control of 48 sections, electric plumbing and digital filling controls. The standard version uses manual taps and electric ball valve boom sections. Prices are from £50,000 for the standard version with GPS section control adding £1,900 and £70,000 for the Xplorer i. The Hardi Alpha self-propelled sprayer is now available with 5,100 litres capacity, and features the new Evo 2 cab with Cat IV filtration. To extend working life the filters are only activated during field work. Alpha machines are now fitted with FloatRide air bag suspension which adapts to the weight of the tank, while track width is hydraulically adjustable by 1m. Designed as a relatively lightweight self-propelled, the Alpha can be specified with a range of booms up to 44m. 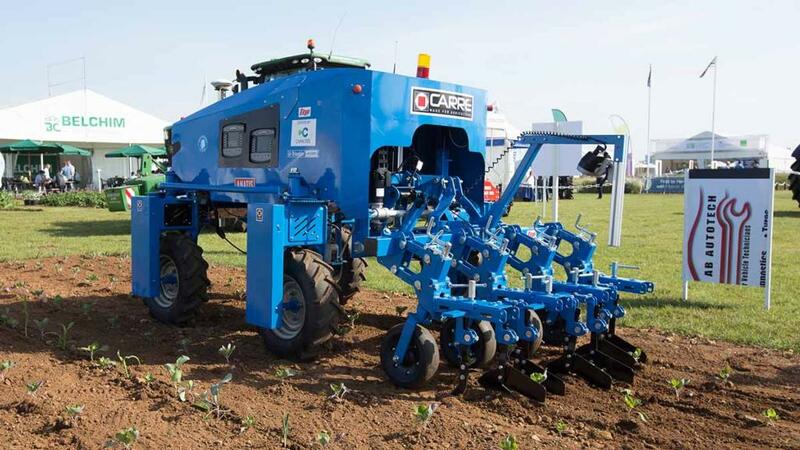 French maker Carre used Cereals to demonstrate its Anatis field robot – an autonomous inter-row mechanical weeding machine that can also be equipped with a wide variety of sensors for data collection. While it has a long way to go before it supersedes a 200hp tractor and 12m weeder, the battery-powered machine does carry a three-point linkage on which it can carry different implements from the French maker’s range. 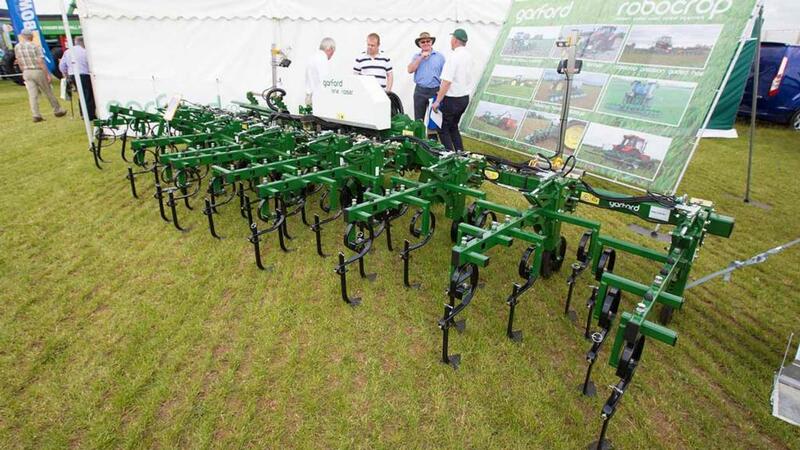 These include a rotary hoe, comb harrow and inter-row cultivator. At 1.2m wide, but with an adjustable track width from 1.35 to 2.05m, the robot is said to be suited to bed work and for vegetable and salad crops. It is likely to attract the interest of growers concerned about migrant labour shortages, despite its €80,000 starting price. The three 12v batteries drive the four-wheel drive, four-wheel steer machine, with operating time limited to about four hours. Automatic section control is now available on Garford’s range of vision-guided Robocrop mechanical weeders, following the development of the Tine Raiser. This RTK-controlled hydraulic raise and lower function allows machines from 4m to 12m working width to be automatically controlled at headlands. With hoeing equipment mounted on the main beam in sections covering three 15cm rows, each assembly can be raised and lowered according to implement position. Manual control is also available, and the Tine Raiser system can be retro-fitted to any Garford machine. With lone worker safety in mind, Precision Decisions has developed the Topple Alarm. Using a GPS-based tracking device, the unit can be mounted onto a quad bike or tractor, and its tilt sensors can be programmed to warn of an over-turn, for example. Using a roaming SIM that can access multiple cellular networks allows the device to maintain network access in remote areas, where single network systems can often fail. Mr Blacker adds that the device can also be programmed with an operator ID, which prohibits engine starting unless the correct ID is used. The Topple Alarm is priced from £300 plus the cost of the SIM card and its network charges. Storm Agri Pro is a custom-built multi-spectral drone package from Northumberland drone firm DroneAg. The Storm is said to be a weather-tolerant, easy to fly solution for those seeking intense data capture, with the ability to cover 50ha per flight. 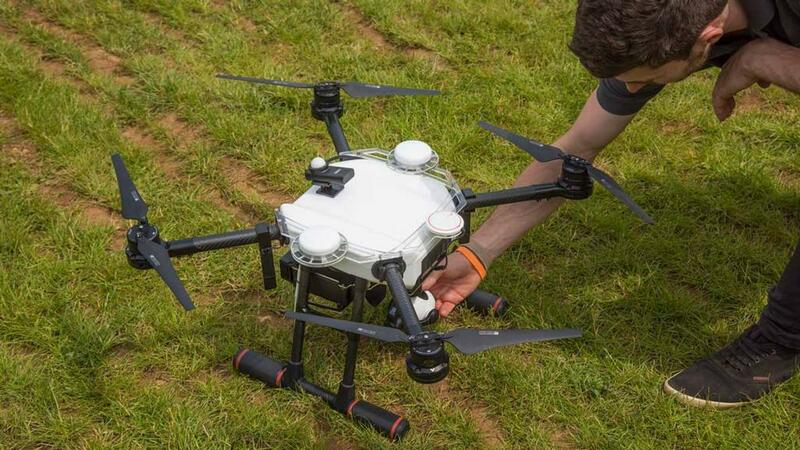 “Most of the data is processed on-board the drone, thanks to the use of a Slant Range sensor, which is the most advanced multi-spectral unit available for this type of work,” explains pilot and DroneAg director Jack Wrangham. The Storm Agri Pro costs £9,500. An additional £3,500 sees the Storm enhanced with an RTK system to give 1cm accuracy for those seeking plant height measurement to determine biomass and plant density, and terrain modelling. 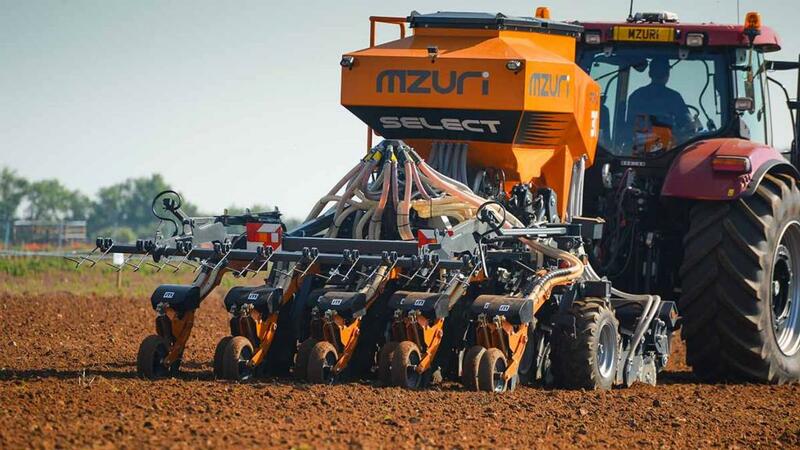 Flying the flag for Britain, Mzuri demonstrated its latest strip-till drill development at the event, which features precision seed metering. Capable of drilling maize, soya, sunflower and cereal crops in one pass, the firm’s standard coulter assembly is replaced with a new unit, which features a vacuum precision seeding unit. Forward speed for seed placement is calculated by the on-board satellite receiver, and UK models will feature seed hoppers for each coulter, unlike the European model demonstrated which uses the main hopper as a bulk tank. The firm says as coulters are spaced at 350mm intervals, generally customers will specify only to use half of the coulters for maize drilling at 700mm spacings. Mr Lole says this allows drilling inbetween the previous year’s rows, again retaining moisture in the soil. Available on new or as a retro-fit on three, four and six metre width machines, the system is priced at £2,400 per unit ontop of the drill’s retail price. See also: We test Mzuri's Razorback hedgecutter, which launched at Cereals 2017. Grange Machinery has extended its low disturbance cultivator toolbar range with the addition of a hydraulically folding, six-metre working width model. Designed to take a pass out of the cultivation and drilling process, the toolbar uses a fixed frame coupled to the tractor’s rear linkage, and features an adjustable hitch coupling at the rear, where a drill or cultivator can be attached. A separate frame is used to hydraulically raise and lower the cultivator’s legs, allowing the drill’s or cultivator’s drawbar to remain at a constant height. 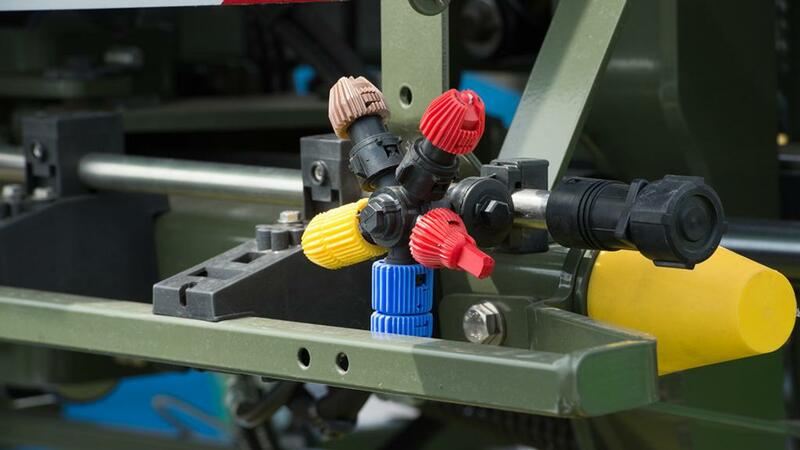 Hydraulic, electrical and IsoBus connections are run to the rear frame to operate the drill or cultivator, if required. When raised out of work, the outer wing sections on the hydraulically folding model can be swung forwards, which the firm says offers a 55 degree drawbar angle for the trailed implement. Options include slitting discs and wider legs and shoes. Price for the 6m model on show with slitting discs is about £23,000. To further expand its UK tillage equipment offering, Opico has begun importing Maschio’s range of mounted reversible ploughs. Two ranges of in-furrow plough are offered, with the Unico M available in three-five furrows and rated up to 200hp, and larger Unico L range boasting up to six furrows and can work with tractors up to 300hp. Both ranges feature shearbolt protection and manual vari-width as standard, which offers adjustment in 50mm increments, from about 270mm-540mm. Hydraulic vari-width is available as an option, offering widths 250mm-550mm. hydraulic auto reset is also available as an option, which features a piston-type accumulator and allows both vertical and horizontal movement. Other features include simple pin adjustment of skimmers, and a dual-purpose depth/transport wheel, reducing strain on the tractor when traveling on the road. Retail prices for Unico M models starts from £13,603, while the Unico L range starts from £18,961. Aiming to bridge the gap between traditional box drills and higher-spec air drills, Amazone’s latest IsoBus compatible box type combi-drill is packed with tech. The 3m wide unit is mounted to the power harrows packer roller via a manual adjustable linkage. As the drill unit and harrow’s levelling board are mounted to the roller, harrow depth can be controlled independently of coulter depth. Seed flows from the drill’s 840litre hoper to an electrically driven metering system, which allows for automatic shutoff at headlands. Control and power is via IsoBus connection, and, as an option, the metering system can be split into two parts, giving sectional shutoff to reduce overlap further. Hope size can also be extended to 1,270 litres. Other features include a centralised adjustment station, which the firm says makes calibration, rate control and changing seeds simple. A number of roller options are also available to suit soil conditions, including a new 600mm version of the firm’s Matrix roller. Seed placement is either via the firm’s new TwinTeC double disc coulter or its tried and tested single disc RoTeC coulters. Retail price starts from £30,000-£50,000, depending on spec level. Taking cues from its American counterparts, Grimme is testing the European market with a new in-field crop transfer bunker. With a carrying capacity of up to 18tonnes, the bunker features a front-mounted unloading conveyor, which the firm says can empty the bunker in less than three minutes, and is telescopic to reach further and lower into road trailers. Crop can also be unloaded through a rear door for bulk pilling. Drive to the bunker’s moving floor and unloading conveyor is via the tractor’s pto. 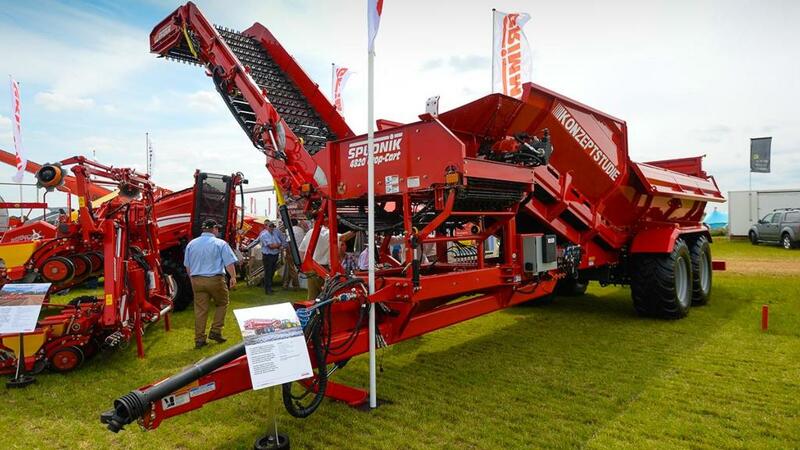 Grimme says the CropCart is aimed at users where crop is transferred straight from the field for processing, and removes the need for transfer trailers to travel in the field, dragging mud onto the road. Other features include drop sides for lower drop height from the harvester, hydraulic suspension and a rear following axle. The CropCart will undergo customer trails over the next 12 months, with a look to producing machines if successful. 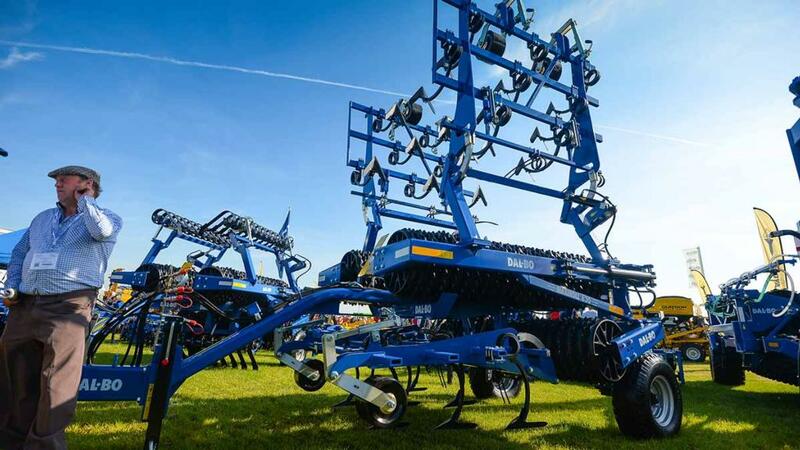 Targeted at farmers who are big machine features but on a smaller scale, UK machinery importer Halse showed its smallest Ovlac Versatil tine cultivator. Suitable for tractors 90-120hp, the 2.4m wide cultivator features eight Hardox steel legs, with tungsten carbide points and wings. As standard all legs feature sprung auto-reset protection, with the option of a hydraulic system. Without wings fitted, Halse says the machine is effective at depths down to 350mm, and about 100-150mm with wings fitted. Six serrated discs and rear roller are mounted to a parallel linkage which controls machine working depth, with separate adjusters to alter disc working intensity. Fitted with a spring rear roller, the Versatil has a retail price of £12,780. Following customer demand to further expand its range of flexible roller attachments, Dalbo showed its latest roller-mounted stubble cultivator. Available on its smaller Maxiroll range of hydraulically folding rolls, the attachment is mounted in front of the rolls and features a number of rows of wide-wing cultivator points. Due to folding mechanisms, 5.3m-8.3m wide models feature three rows of points, while larger 10m and 12m models use two rows of tines. Tine sections are lowered into and out of work hydraulically, and depth control is via manually adjustable depth-wheels. Capable to work directly behind a combine, the firm says its stubble section cultivator and ring-roller provide a quicker establishment of weed growth prior to spraying off, than a more conventional stubble rake or discs, as it provides effective seed to soil contact. 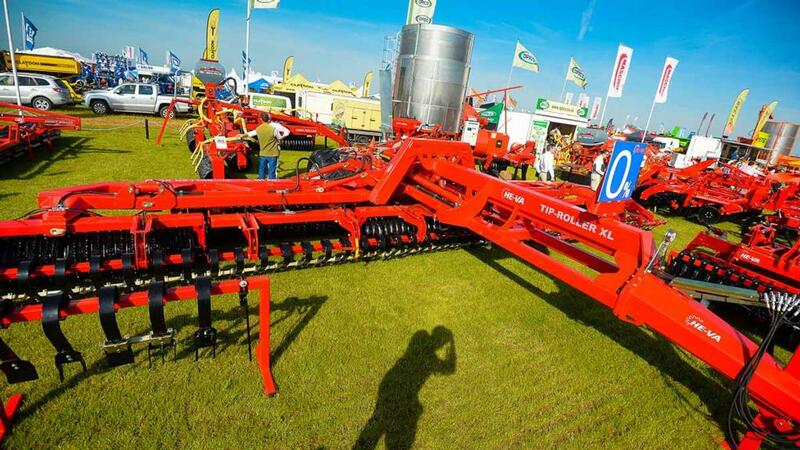 The 6.3m Maxiroll showcased at the event with 55cm rings and stubble section retails at £20,200. Alternatively, the stubble section could be purchased and interchanged with another tool for greater flexibility. 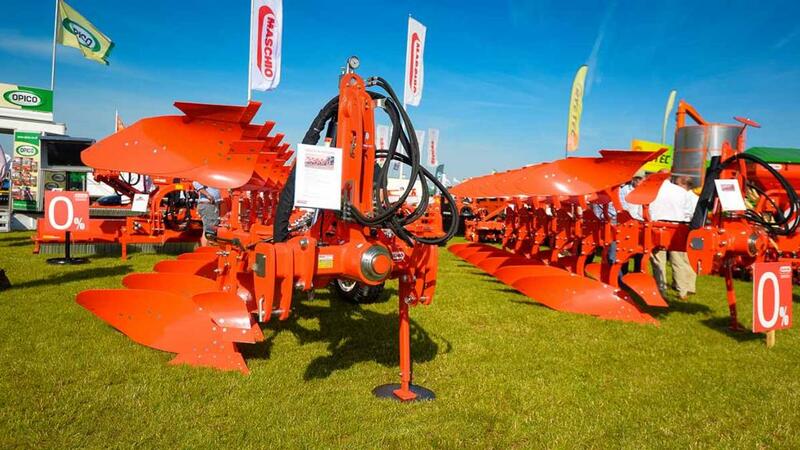 Hoping to offer customers a flexible machine which can do both primary and secondary cultivations, Kuhn’s Prolander cultivator got its UK launch at the event. Available in 6m and 7.5m working widths, spring tines are mounted in four rows, with increasingly larger spacing’s in-between tine rows at the rear to prevent blockages. Working depth ranges from 30-150mm, with wide shares fitted for shallow working to encourage grass-weed growth prior to spraying off. Depth is controlled hydraulically via the front-mounted depth wheels and rear packer roller. Power requirement ranges from 150-300hp, depending on working conditions. Double rear roller is fitted, which can be a U profile or cage roller, depending on desired finish. 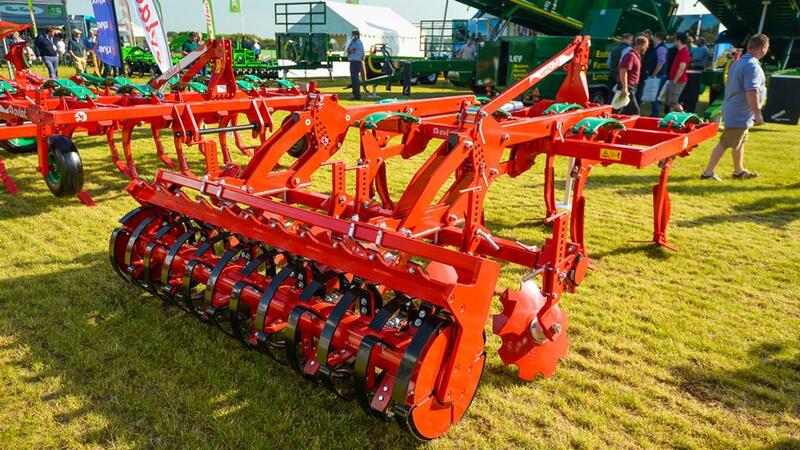 Harrows leading and following the roller can also be specified as can hydraulically controlled front levelling boards. Retail price for the 7.5m wide model on show, with U profile roller is £37,607. 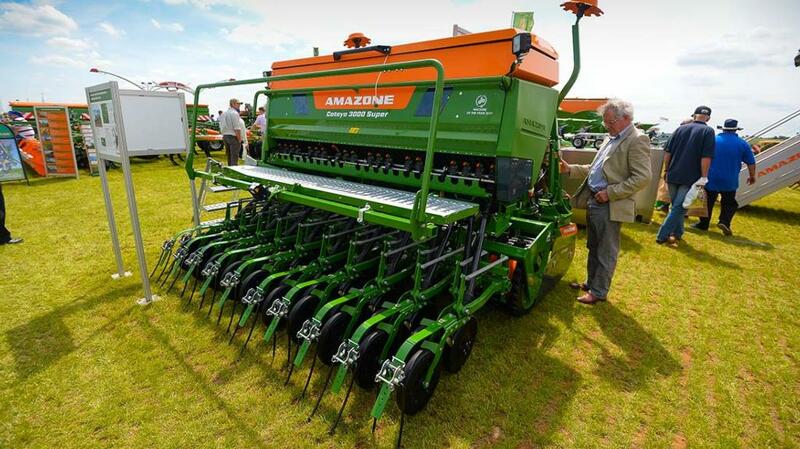 Aiming to fill a gap in the middle of its shallow disc cultivator range, Amazone showcased its latest Catros models. Now available in seven, eight and nine metre working widths, the trailed models feature three working sections. 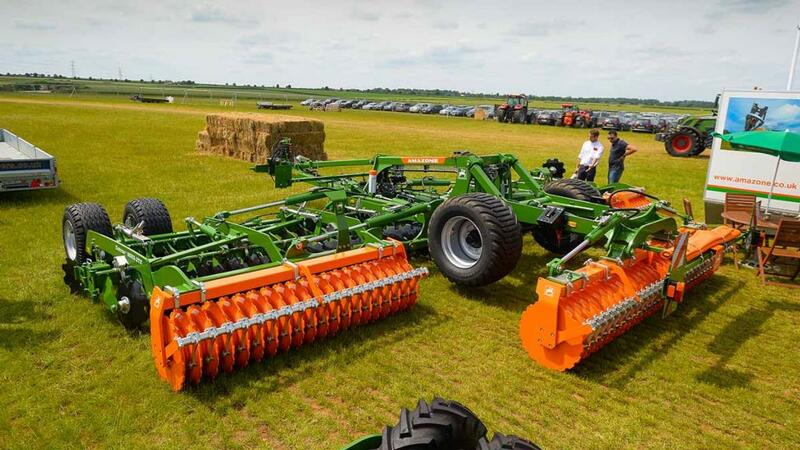 Two rows of smooth or serrated discs are featured, which feature hydraulic adjustment of working depth, with machine pitch set by the fixed rear roller and adjustable front land wheels. Nine different rear roller options are available, ranging from the standard cage roller, to the DW disc as fitted to the model on show. Up front, hydraulically adjustable paddle boards can be fitted to bash about soil. Retail price for a fully specced nine metre model is £103,655. Opico’s range of He-Va toolbar rollers has gained an output boost, with the addition of new wider models. Previously only available in widths up to 10.3m, the range now extends to 15.3m, which uses five centre-pivoting roller sections and the firm’s active transfer system to provide an even pressure across the machine’s entire working width. 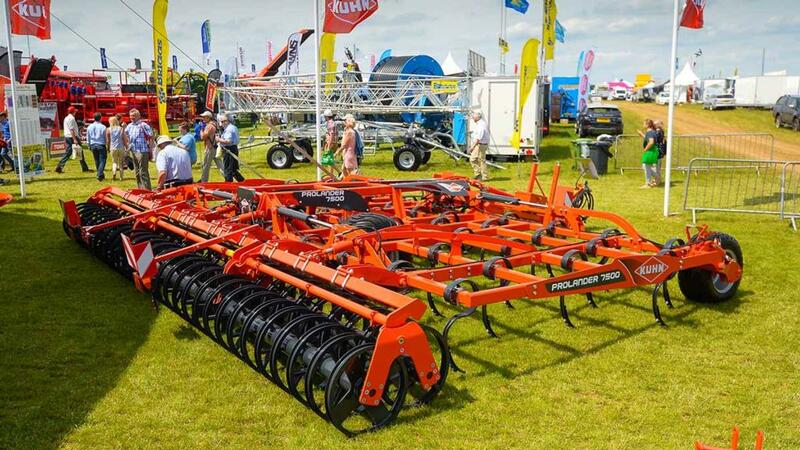 Differing from its wider King rollers, the TIP range’s folding system allows shattaboards or two rows of spring tines to be mounted, allowing the roller to be used to encouraging grass weed growth following harvesting. Working intensity for both systems is controlled hydraulically. Opico’s James Woolways says the combination of boards or tines, with its ring roller creates a chitting in the soil before rolling to preserve moisture which allows the seeds to germinate properly. He continued to say farmers are using the roller toolbar system as a chitting tool, as much as specifically for rolling. Available now, a 12.3m machine costs £38,013 with boards, or £41,631 with tines. Improving traction for its 7R range is the reasoning behind Deere’s EZ Ballast system, which sees a 1,700kg weight hoisted up underneath the tractor. 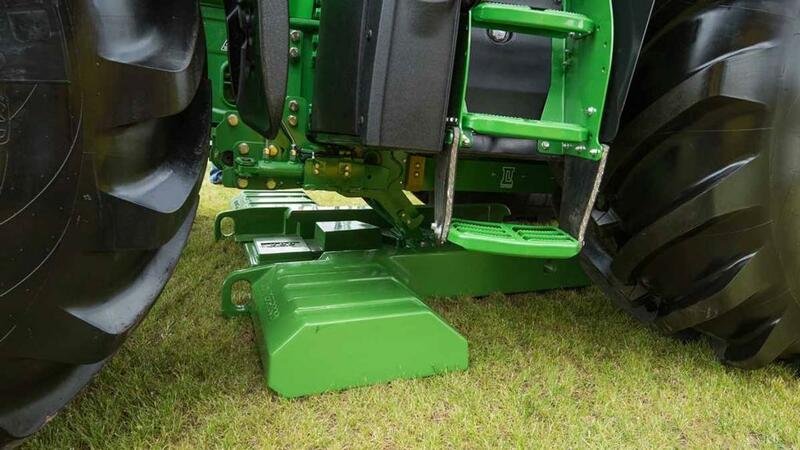 As the weight is held under the middle of the tractor’s chassis, the firm says it maintains a 60/40 weight distribution, while keeping both front and rear linkage free for other implements. The weight is lifted by a single hydraulic ram, which is powered via a dedicated valve meaning no spool valves are taken up. Manufactured by La Forge and imported into the UK by Risborough Ag Services, the system is only available as a retro-fit for 7R tractors, with the lifting system and weight costing £10,850.